Today’s “Peanut Butter Chocolate Chunk Brownies” recipe came from Louise, who emailed me a photo and note saying how great it was. This happened about a month ago, and I’m kicking myself for not making these sooner. They’re dense, moist, packed with peanut butter flavor, and not overly rich or sweet even though they’re topped with a chocolate ganache. As a bonus, they’re easy. I made a half batch today using things from around the kitchen and some Nestle chocolate chunks. The results were fabulous. The recipe below is for a 13×9 inch pan, but you can also halve it and make it in an 8 inch pan, which is what I did. For the 8 inch version, I baked it at 350 for about 30 minutes. The brownies were great, but the edges were quite a bit more cooked than the center, so next time I halve it I’ll cook at a lower, slower heat like 325. Then again, next time I’ll probably just make a full batch. Louise says her full batch brownies were best when baked for only 35 minutes. She also used peanut butter chips in place of chocolate and liked it that way. Me, I liked the chocolate chunks. Preheat oven to 350 degrees F. Line a 13x9 inch metal pan with foil and spray bottom with cooking spray or rub with butter. Cream the butter and sugar with an electric mixer. When light and fluffy, add peanut butter and beat until incorporated. Beat in eggs, the egg yolk, salt and vanilla. By hand, stir in the flour and chocolate chips. Spread batter in pan, patting it down flat, and bake on center rack for 35-40 minutes or until puffed and golden. Cool completely. Make the ganache. Put the chocolate chips in a heat-proof bowl. In a saucepan or in a microwave-safe measuring cup, heat the cream until starts to boil. Pour the cream over the chips and let stand for a minute. Stir well to melt chips; stir in the butter. Spread on cooled brownies and let set. For best results, weigh the flour. If you measure by volume, pour the flour in a bowl and stir it so that it is fluffy and not at all packed. Too much flour contributes to dryness. « Hello New Readers, Old Readers and Commenters! Finally got around to baking these this week. I didn’t change anything, they were really, really easy and good and kept well. These will be made again. Every time, I come here, I find something I want to make. This is today’s choiice. I have mentioned in one of my blogs that I bake for my class and this should be a winner with them. I made these yesterday and they are so, so good! I made a half batch in a 9×9 metal cake pan, baked at 325 for about 28 or 30 mins. I used 7 tbsp butter and an extra tbsp or two of PB, also subbed out a bit of sugar with 1/4 cup splenda. Also, I couldn’t decide on PB chips or chocolate chunks, so I took half the batter and added PB chips and the other half chocolate chunks. I baked right in the same pan and then frosted the PB chip half only with ganache. YUM! Not too dry at all, but not at all greasy. I’ve had a recipe very similar to this bookmarked for a very long time now. Maybe I’ll finally get around to making it, or this one! – you’ve inspired me! I l ove the sounds of these! Can’t wait to give them a try! Sue, I think that’s why I prefer these with pb chips instead of cc’s, and I love chocolate. The other change I always do to this recipe that I forgot to tell Anna, is I use bittersweet chocolate for the ganache. My husband’s not a frosting fan, but he likes these too. Do you think there’s something wrong with a person who loves chocolate but finds chocolate ganache too much? This same person (me) isn’t wild about frosting in general. I’ve made ganache that other people swoon over and beg for me to make again, but it just doesn’t trip my trigger. These look great. Maybe I should try them with just a drizzle of ganache? I made this recipe off Smitten kitchen maybe 2years ago and it’s a regular for me ever since. I leave off the ganache, though. At least for every day use, and it’s still fantastic with just some nice dark chocolate chunks. Mmmmm. I think I shall make these!! They look great…moist and yummy. BTW, I made those peach scones you posted the recipe for the other day and they were wonderful!!! I’ll be posting them soon! I use more chunky peanut butter but I haven’t cut back on the butter. They don’t seem the least bit greasy. And pb chips instead of chocolate chips. I like the intense pb flavor. It seems to pair well with the ganache. And, like Anna said, I bake them less as I think they are overbaked as called for. I’ve made them several times over the last six months and they’ve been a hit everywhere I’ve taken them. Hello! WOW, those brownies look sooooo good! Thank you for all the inspiration you supply us with in your blog! AND the fantastic (well tested and fail proof) recipes! You’re the BEST!!! Love you! These look so amazing – what do you think about using a touch less butter and a bit more peanut butter? 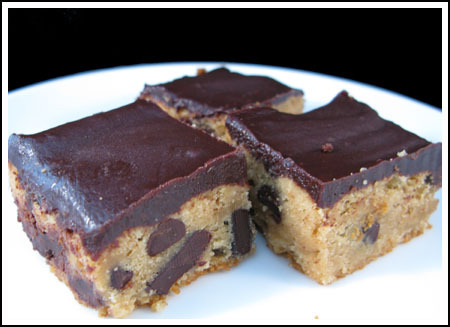 These look really addicting with all those chocolate chunks! I hope Fuzz feels better soon!! mmmm…they look almost blondie-esque! I love peanut butter with chocolate – might have to give them a try. BTW – love the new look! The recipe came from Gourmet, October 2007. It doesn’t seem to be on their website or Epicurious. I keep seeing these bars everywhere! They make me sooo hungry. It’s just too hot to turn on the oven. Love that photo though.